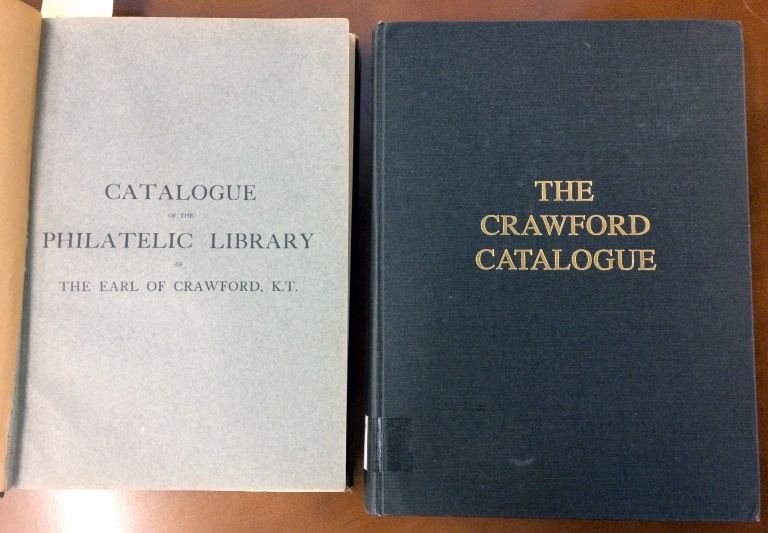 The Crawford Catalogue is simultaneously one of the oldest and one of the newest resources in the library, and it is an invaluable resource for anyone interested in early philatelic literature. The original 1911 edition (left) and the 1991 facsimile (right). 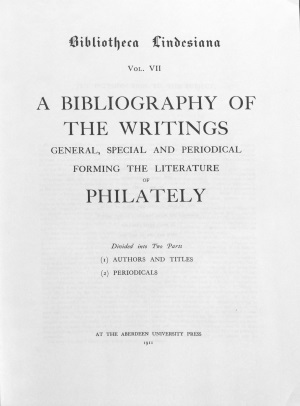 The original catalog, the Catalogue of the Philatelic Library of the Earl of Crawford, K.T., was compiled by Sir Edward Denny Bacon and published in London by the Philatelic Literature Society in 1911. It is an annotated list of the Earl of Crawford’s library, which included the famous library of John K. Tiffany, who served as the first president of the American Philatelic Association (now the American Philatelic Society). It is considered the most complete collection of philatelic literature up to 1911, and, because the Earl of Crawford acquired Tiffany’s library, contains a very comprehensive collection of American literature. In addition to the Earl of Crawford’s holdings, Bacon included all known works, and his list was also published by Aberdeen University Press as A Bibliography of the Writings General, Special and Periodical Forming the Literature of Philately. Following the Earl’s death in 1913, he bequeathed his library to the British Museum. The Museum’s library holdings were transferred to the British Library when it was founded in 1973, where they remain today. In 1991, the Printer’s Stone Limited, in association with the British Library, published a revised edition of the catalog, the Catalogue of the Crawford Library of Philatelic Literature at the British Library. This edition includes shelfmarks (call numbers) for the British Library’s holdings, allowing it to serve as a reference for those requesting material from the British Library. In 2016, the British Library and the Global Philatelic Library unveiled yet another edition of the catalog, this time available online. 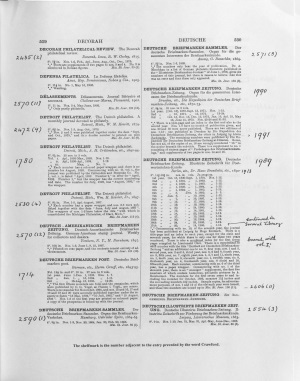 The online edition includes a digital, searchable version of the original 1911 catalog, plus the 1926 supplement and 1938 addenda. 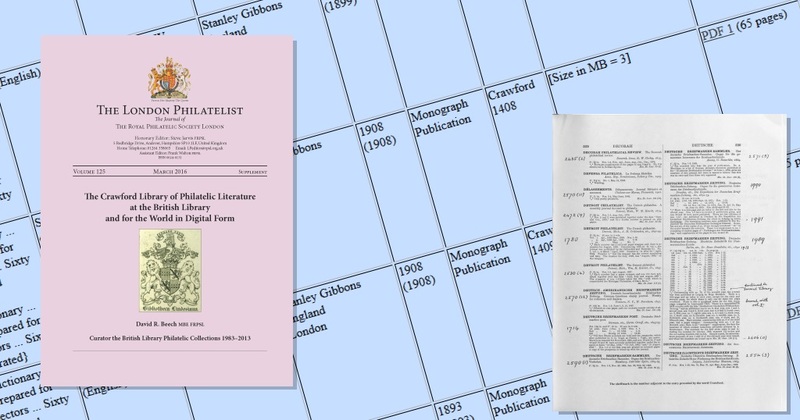 Even more tantalizing for anyone interested in early philatelic literature, though, is the searchable index to the Crawford Library, which includes downloadable PDFs for most items in the library. Nearly everything from the obvious (like The American Philatelist) to the obscure (like Collector, a periodical which published one small issue in 1905 in Pittsburgh, Pa.) is available. A more complete description of the Crawford catalog’s history was published as a supplement to The London Philatelist in March 2016, and is available online.